A North London derby between two sides in similar boats at the moment. Arsenal have fallen away in recent years and Unai Emery faces a tough job to get them back to the top, while Tottenham Hotspur have failed to invest in a squad that has performed superbly under Mauricio Pochettino but needs support. Despite this, both teams have got excellent results this season after tricky starts (although supposedly the performances haven’t backed these up – I haven’t seen much of either team so can’t really comment). Emery switched up his team’s shape, going for a 3-4-3 formation, whereas Pochettino went for a 4-4-2 diamond. Arsenal had a far better first half despite going in a goal behind. The front three put pressure on the Spurs defence as they looked to play out from the back, while the wing-backs pushed forward to ensure Ben Davies and Serge Aurier were hemmed in. Not helped by the main players they were looking for were Eric Dier and Moussa Sissoko – neither of whom are very good on the ball – the flustered Spurs backline frequently gave the ball away in their half, immediately putting themselves on the back foot. The home side found it much easier to play out from the back, drawing the narrow Spurs set-up to one side before spreading it out to the other, either with a cross-field ball out to the wing-back or a less risky pass along the ground to the centre-back on the opposite side. Arsenal’s main way of progressing the ball was through the wing-backs: Alex Iwobi, Pierre-Emerick Aubameyang and Henrikh Mkhitaryan would stand between the members of Spurs’ back four, forcing them narrow, then the ball would be spread wide to the wing-backs in acres of space. 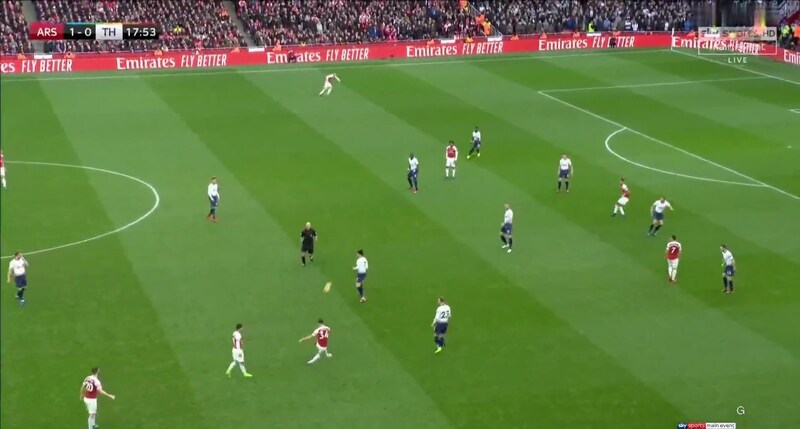 Aurier in particular was struggling with this, with Iwobi’s positioning more disciplined than Mkhitaryan’s, who had a tendency to wander into midfield that made it simpler for Davies to close down Hector Bellerin. Spurs weren’t completely dominated – Dele Alli and Christian Eriksen looked dangerous whenever the defence could find them – but Arsenal taking the lead fitted with the flow of the game despite coming from a penalty. Although they were still on the back foot, Tottenham managed to go in at half-time with the lead thanks to the work of Son Heung-Min. As the half went on, he tracked back more, helping those behind him to deal with the threat of the wing-backs – there appeared to be a slight positional change, with him dropping back a bit and Alli moving wider, to allow them to press the back three better. He had a more direct influence on the game going forward though: both the free-kick leading to the equalising goal and the penalty were won by Son running into the space behind Bellerin, dragging the centre-backs across to challenge. Emery made attacking changes at half time, substituting Iwobi and Mkhitaryan for Aaron Ramsey and Alexandre Lacazette, as they shifted slightly to a 3-4-1-2 – the strikers would split wide to open up gaps in the defence for Ramsey to run through. The equalising goal came soon after, created by excellent technical quality and the new frontline – both Bellerin’s pass and Aubameyang’s finish were superb, while Lacazette pulling wide opened up space for Ramsey to attack – yet also showing several of the issues from the first half: Bellerin had too much space and Aurier doesn’t get the right side of his marker. Presumably concerned by his defence getting stretched, Pochettino moved Dier into the backline, while an injury to Shkodran Mustafi saw him replaced by midfielder Matteo Guendouzi. 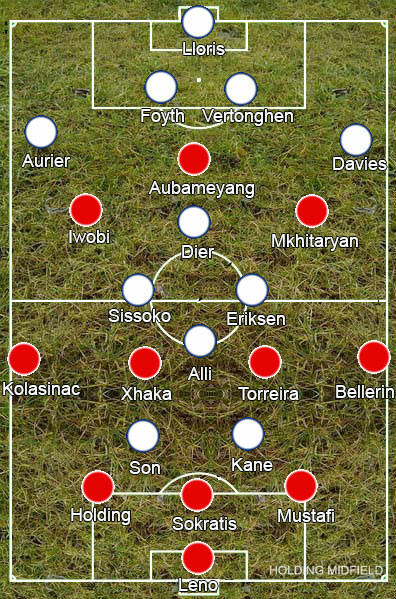 The formations had flipped – Spurs now in a 3-4-1-2 while Arsenal were in a 4-4-2 diamond – but the momentum didn’t. The addition of Dier to the backline didn’t really help Tottenham play the ball out, while their long balls to the forwards were getting easily mopped up by Arsenal’s defence. As a result, Arsenal kept them pinned back, Aurier and Davies unable to get forward, and the strikers and Ramsey pressing the backline. Soon after, Juan Foyth gave the ball away on the half-way line, allowing Ramsey to play in Lacazette to take the lead. Three minutes later, Dier, looking uncomfortable in defence, missed his attempt to cut out a pass, leaving Lucas Torreira to double Tottenham’s lead. Pochettino made attacking changes, bringing on Harry Winks for Alli, which allowed Eriksen to move forward into his more natural number ten role, Lucas Moura replacing Son and Danny Rose coming on for Davies, but a misplaced pass by Dier meant Jan Vertonghen jumped into a challenge that earned him a second yellow card, effectively ending any hope of a comeback. The goals may mainly have come from individual errors but Spurs were outplayed over the 90 minutes. There are some question marks over personnel – this looked a step too far for the young Foyth – but the greater ones should probably be over the formation: Arsenal attack a lot through their full-backs, so Spurs’ back four and lack of width handed them the impetus here.